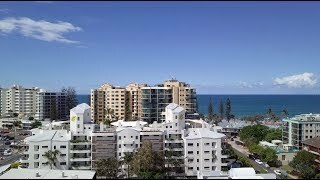 Caribbean Resort Mooloolaba is in an ideal location to explore the best of the Sunshine Coast, centrally positioned within the iconic Mooloolaba beach precinct, an hour's drive north of Brisbane. The spacious apartments have private sunny balconies, in-room spas with separate shower, full kitchen, laundry, movie/sports channels and air-conditioning. The rooftop apartments also have a private rooftop deck with Jacuzzi and barbecue. Resort facilities include a heated 25 metre lap pool, a one-of-a-kind rock spa and waterfall, shaded kids wading pool, rooftop barbecue area for all guests, games room, gym, steam room, on-site family restaurant, free secure parking plus more. From the resort, you'll find yourself within easy walking distance to 50 plus restaurants, cafes and bars as well as endless shopping and beauty salons. The patrolled beach is 100 metres away which offers protected swimming between the flags. Enjoy a river cruise, go deep-sea fishing, sailing, scuba dive the HMAS or see the marine life at Sea Life aquarium. If you prefer to keep your feet dry, they've got walking tracks, parks, playgrounds or bike hire all on their doorstep. Offering great value for couples or solo travellers, their standard one bedroom spa bath apartments exude their original beach side charm. Entering into an open plan living and dining area you will find everything you need in the full-equipped kitchen. The apartment also contains a private laundry, spa bath in the bathroom and private balcony. There is a separate master bedroom which contains one queen bed. These rooms are located on levels ground to four. Sleeps two people (extra person AUD20 per night with rollaway bed). Boasting two bathrooms, it is the only apartment of it’s kind in the complex. 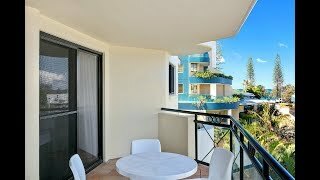 Their Two Bedroom Ensuite Apartment also offers a touch of luxury with a private jacuzzi on the patio and has been fully refurnished and renovated. 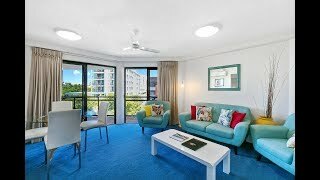 As one of their most requested apartments, you will need to book well in advance. There are two separate private bedrooms. The master bedroom contains one queen bed and the second bedroom contains two single beds. The room contains an ensuite and full bathroom with bath. These rooms are located on level one and contain a jacuzzi on your private patio. Sleeps four people (extra person AUD20 per night with rollaway bed). Perfect for the family holiday at the beach, their standard two bedroom spa bath apartments are ideal for practical family living. Featuring a living area, fully self-contained kitchen, private laundry and spa bath, enjoy the beach style living from your private patio. There are two separate private bedrooms. The master bedroom contains one queen bed and the second bedroom contains two single beds. These rooms are located on levels ground to four. Boasting a renovated kitchen, bathroom and fully re-furnished, their two bedroom superior spa bath apartments are perfect for that extra special holiday. 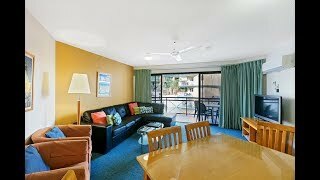 Stepping up from the original, make yourself at home in this re-furnished beach style apartment, complete with fully self-contained kitchen and private balcony. There are two separate private bedrooms. The master bedroom contains one queen bed and the second bedroom contains two single beds. These rooms are located on levels one to four. Perfect for families and entertaining relatives and friends, their private two bedroom rooftop jacuzzi apartment offers your own private gated rooftop area accessible via lift your private stairwell from your balcony. Enjoy cooking on your rooftop barbecue or relax in your own jacuzzi while enjoying the sunset. Situated in a prime position on our top floor complete with outdoor dining facilities. There are two separate private bedrooms. The master bedroom contains one queen bed and the second bedroom contains two single beds. These rooms are located on the top floor (level five). They have an ocean glimpse view from the balcony. Their Two Bedroom Spa Bath Apartment with Ocean Glimpse offers beautiful, partial glimpses of the Pacific Ocean from your private balcony. 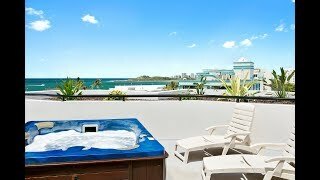 Featuring a fully self-contained kitchen, laundry and spa bath, book that extra special holiday and escape from the ordinary on your next trip to Mooloolaba. There are two separate private bedrooms. The master bedroom contains one queen bed and the second bedroom contains two single beds. These rooms are located on levels two to four. Their is an ocean glimpse view from the balcony.